If you're on Facebook or Twitter, you can get a free bonus chapter from Polymer Clay 101 just by tweeting or posting a status message. (I'm using a very handy new service called Pay with a Tweet to do this.) 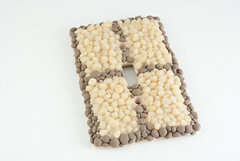 The download will show you how to make faux polymer clay pebbles and use them to cover a light switch plate. I recently set my blog up with Flattr, a site that allows users to give and receive micropayments for useful online content. Look for the Flattr button at the bottom of each blog post. We got close to a foot of snow when the big storm passed through, so I'm hiding inside with chai tea, crock-pot yummies, and a blanket in every room. Hope you're staying warm wherever you are! Links to some of my new social media type stuff.